Dr. Venkataratnam Kolla was interviewed at HCC studio on June 28 by Sita Mutyala, MBA, an author, artist, a social worker and a community activist. HOUSTON: Who said Houston’s Indian community consists of only Doctors and Engineers? Little known fact in that there are outstanding Geoscientists (Geologists and Geophysicists) of Indian origin living in Houston quietly doing their research and publishing scientific papers, not seeking any publicity of any sort. Their employers, usually multi-national Oil and Gas companies derive enormous profits from their predictions of potential oil and gas wells buried beneath the earth. Among them is one Dr.Venkataratnam Kolla, 76, a Petroleum Geologist who has been doing consultancy after retiring from a French multinational oil company. Dr. Kolla whose mother tongue is Telugu, earned his Ph.D. in Marine Geology under Prof. Mahadevan from Andhra University in Visakhapatnam. He came to America in 1967 at the age of 31 on deputation from Govt. of India under a UNESCO plan to carry out post-doctoral research. His wife, Ramani and two kids joined him in Seattle after one year of his arrival in the US. In 1970 he moved with his family to New York to work at Columbia University’s Lamont-Doherty Earth Observatory labs located 18 miles away across the Hudson River in Palisades. Here he carried out extensive and pioneering marine geological research investigations of the Indian Ocean. Being the oil and Gas capital of the world, Dr. Kolla had visited Houston and attended many conferences here. He liked its hot and humid weather which is akin to the coastal Andhra Pradesh, particularly Visakhapatnam located on the Bay of Bengal. He decided to make Houston as his family’s permanent home. He recalls, in 1982, when he relocated to Houston, the West side of Houston where he still lives, did not develop much. He feels quite at home in Houston. He became a naturalized US Citizen in 1981 and has no desire to go back to India on a permanent basis, other than for consulting and advising in petroleum exploration (oil companies)and marine geological research investigations( National Institute of Oceanography and Universities), visiting relatives and seeing places. Dr. Kolla lived for six years in Southern France working for a French Multinational Oil Company and toured U.K., Africa (Nigeria, Angola , Cameron) and Netherlands frequently, and for two years in Angola, West Africa. He was instrumental for significant hydrocarbon discoveries in the deep off shores of West Africa and North Sea. He organized several Technical Conferences in his field of Petroleum Geology and also published scientific papers for which he received several awards and citations. However, Dr. Kolla derives immense satisfaction from the fact that as a Consultant to the Reliance Industries Ltd., India, the front-end research studies that he had done had helped significant discoveries of oil and gas in the Krishna-Godavari basin. He feels that it is a sort of giving back to his mother country besides supporting some charities in India. Dr. Kolla has one son, Srinivas and one daughter, Vijaya Laksmi, both of whom are married and well settled with children of their own. Asked whether he experienced any color bar or discrimination throughout his 46 years in this country, Dr. Kolla said even though he sensed sometimes subtle discrimination, by and large, he did not face any direct discrimination. He however, narrated a minor incident that happened, when he heard someone refer to him as “colored man”. This happened in the year 1967 in the state of Massachusetts, on the Campus of the Harvard University. The Indo-American Oral History Project is an undertaking of the Foundation for India Studies done in collaboration with Houston Public Library (HPL) and Houston Community College (HCC). The Indo-American Oral History Project is a repository for the stories, accounts, and memories of those who have chosen to share their life experiences. All interviews will be recorded on video and permanently stored along with the transcriptions in HPL’S digital archives and will be made available over the Internet for the benefit of historians, researchers, students and future generations of Indo-Americans. 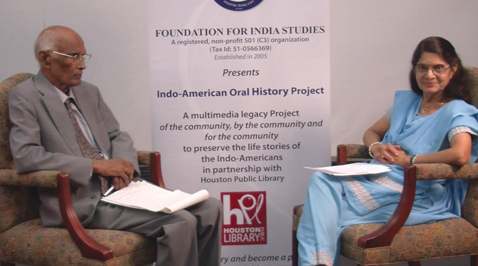 Interviews of Indo-Americans already uploaded into HPL archives can be viewed by logging on to: http://www.houstonoralhistory.org/interviews-indoamerican.html.